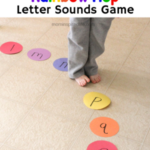 This alphabet relay game is a fun way for toddlers and preschoolers to learn letters! 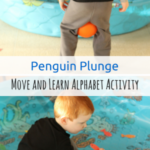 It is very easy to set up, but is sure to be a blast! As I’ve mentioned before, Evan is a mover. He doesn’t sit still for very long and I work with that when I am planning activities for him. I don’t try to keep him seated at the table with worksheets or paper work. I do think there is a time and place for teaching him to sit still and do work at a desk, but at three years old that is not a concern of mine right now. I think it so important to tailor the learning activities you do withyour child to their likes. If your child likes to sit at the table and do paper work, then by all means do that. If your child likes to build and tinker, then do activities that allow them to use those skills. 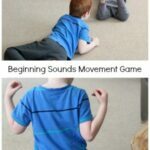 In my case, Evan loves to move his whole body. 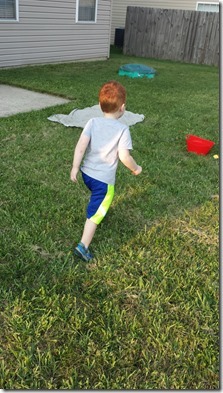 This is why I try to do activities that allow him to move and learn more often than other activities. I do change it up and expose him to all different types of learning opportunities as well. In my opinion, the most important thing is to keep learning fun. I don’t want it to be a chore or something I have to coerce him into doing. 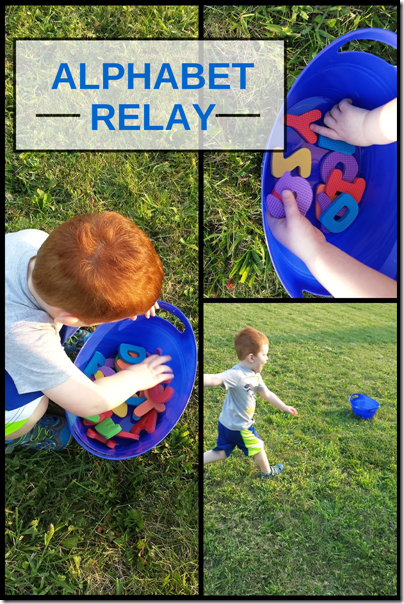 We took this activity outdoors because it is Summer and we are soaking up all the warmth we can before it starts to get cold again. 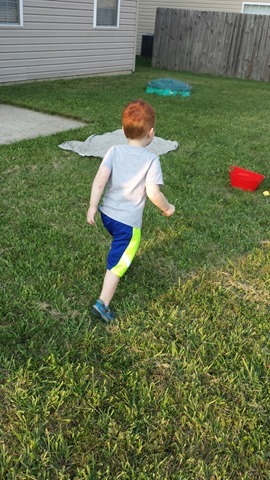 Plus, Evan loves to be outdoors. 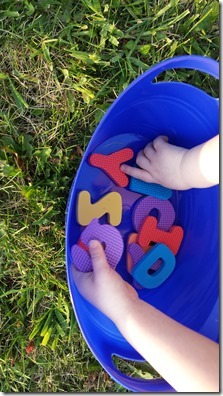 I placed two buckets approximately 20 feet from each other and added foam letters to one. I had Evan stand by the empty bucket. Then I called out a letter and had Evan run to the letter bucket and find the letter. 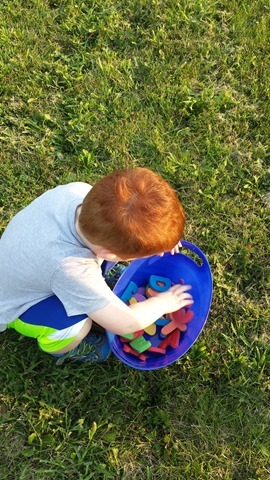 Once he found the letter, he ran back to the other bucket and put the letter in that one. If you want to add more difficulty to this activity you could ask the child to say the letter sound or a word that starts with that letter before running back with the letter. This was another hit with Evan. He loved that he got to “race” back and forth. 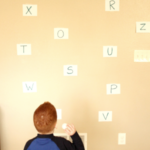 He kept yelling “I’m learning my letters!” while he was running back with the letter he found. It was so cute! 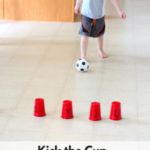 If you like this activity, check out my Toddler and Preschool Learning Activities Pinterest board. 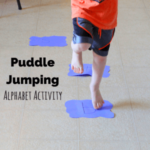 Here are some more alphabet activities I think you will love!